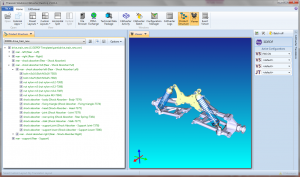 Theorem Solutions recently released Unified Interface (UI), which supersedes Theorem’s CADviewer and UI products, has been specifically developed to optimise both data exchange and downstream processes using a single application that can be used to view, filter, translate and even publish interactive documentation from native 3D CAD data. Incorporating all elements required for successful data exchange Theorem’s new UI extends its use past the bounds of engineering departments to other departments who will also benefit from access to the new UI. Included within certain Theorem CADverter, Publish 3D and Visualize 3D product suites, Theorem’s unified interface can be configured to suit a number of use cases and individual user types: a productivity tool for engineering users, and as a viewing and publishing tool for other users. • Geometry and product structure viewer: Lets the user filter data by viewing the 3D geometry or by seeing it displayed as a structural hierarchy showing the different parts and sub-assemblies. • Viewer: Data can be manipulated in the viewer (i.e. 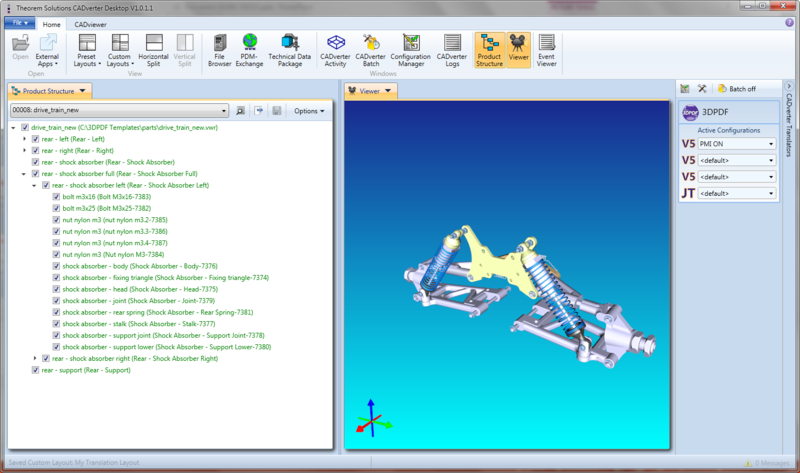 rotate, pan and zoom) and metadata can be added to the part/assembly. • File browser: allows the user to view any incoming data, which can be dragged and dropped from Windows Explorer. • Translation: The UI allows the user to hone their translation strategy before automating the process by letting them review data and create batch files. • Publishing: The UI when used with Publish 3D embeds the 3D CAD data into a PDF document, creating an interactive 3D PDF that can be viewed, manipulated and annotated by anyone with access to Adobe Reader. Traditionally, Theorem’s CADviewer and UI products were aimed solely at the Engineering user whereas the new UI can be utilised by other departments such as Purchasing, Quality & Inspection or Sales & Marketing. As long as users in those departments have access to Publish 3D and the correct engineering CAD part or assembly they can browse, filter, view and then publish the data as an interactive document for their own uses. Most importantly they will have the ability to interrogate the data to aid their own knowledge, understanding and communication processes. Purchasing can create their own RFQ’s, Quality can produce their own Inspection reports and Sales can create their own interactive brochures. The translation features and configuration options which are more geared towards the engineering user can be hidden as part of the individual setup. For the engineering user, the translation configuration manager tool is included to optimise the data read, select the data to write, format the output, and tune the data by data type and audience. The tool lets the user decide what data is needed and then thins it out so that the user only has what they require which can be saved (translated) into the desired format (depending upon available options). The UI also has a number of useful functions which allow the user to create a methodology for large translations and can increase productivity in a variety of ways, allowing them to work interactively, in batch or via the command line interface. Using the UI can save time as there is a batch processing tool available, so that the user can prepare all of the data to be batch processed but can defer the translation job until a more convenient time (i.e. overnight). With the addition of a job status viewer and a log monitor there is a simple and efficient way to keep a list of currently running jobs and monitor what has happened with each job, being notified of errors etc. For the non-engineering departments within an organisation, the UI supports the process of publishing multiple documents/ outputs from a single CAD part or view which can be beneficial as it reduces ambiguity. The user knows that they have the right part needed for their specific use case, having come from the original CAD part itself. When used as part of the Publish 3D product, the UI provides the opportunity for multiple PDF publishing from a single data source using the selection of ready-made templates, or the option of Theorem consultancy services to create bespoke templates. Available as part of the standard maintenance agreement and new product sales for certain CADverter, Publish 3D and Visualize 3D products (from version 18.0 onwards) Theorem’s new UI is helping the development and streamlining of translation and downstream processes, saving time, money, increasing productivity and communication. By allowing engineering data to be filtered, viewed, interrogated, manipulated and translated interactively or in batches with the ability to publish user specific documentation makes for a very powerful multi-departmental application. This entry was posted on Wednesday, November 25th, 2015 at 1:25 am. You can follow any responses to this entry through the RSS 2.0 feed. You can leave a response, or trackback from your own site.